ANCHEER weight belt is manufactured with high-quality materials including a heavy-duty metal buckle and strong adjustable Velcro. Quality manufacturing, a heavy-duty strap, and a sturdy roller buckle all lead to a superior design, which will be there to support and guard your fitness activities whenever you need it. 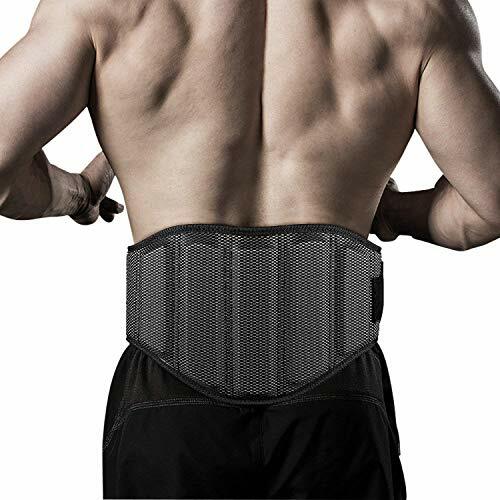 GUIDANCE This belt is designed to support your back while providing you the mobility to perform multiple exercises. Not only can you Body build using the weightlifting belt, but it also ideal for exercises such as Back Squats, Power Cleans, Dead Lifts, Clean and Jerks, Overhead Squats and much more. ➤ Start by wrapping the belt in the open, unfastened position around your mid-back. The Velcro strap should be in your right hand and the metal buckle should be in your left hand. Position the belt so that it will come together over your navel, under your ribcage and above your hip bones. ➤ Pull the Velcro strap tightly and fasten it just tight enough so that you can fit at least 3 fingers comfortably in-between your body and the belt. If you can't move, breath or easily slip your fingers underneath your belt, it is too tight. ➤ When lifting, you will exhale during the hardest part of the lift. When you do this, breath out and press your abdominal wall against the front of the weightlifting belt. This will maximize support to your entire midsection and most importantly to your lower back and typically allow you to lift a heavier weight more comfortably than you might lift without the belt. Notes: If you are not 100% satisfied with the quality or concerned, Please contact us, we will try our best to solve it. NO QUESTIONS - Money back guarantee and top-notch customer service.